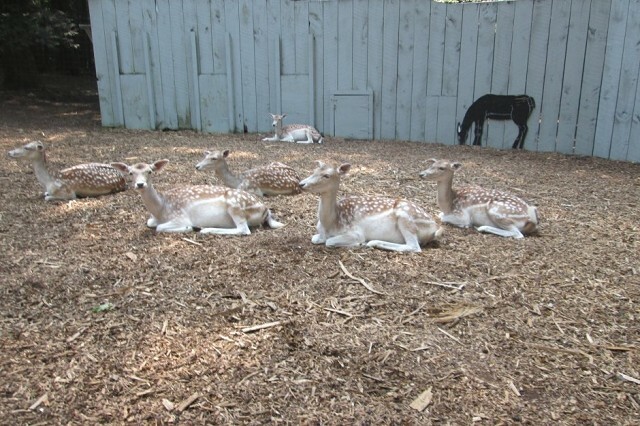 The name fallow is derived from the deer's pale brown color. Only bucks have antlers, which are broad and shovel-shaped (palmate) from three years. In the first two years the antler is a single spike. They are grazing animals; their preferred habitat is mixed woodland and open grassland. During the rut bucks will spread out and females move between them, at this time of year fallow deer are relatively ungrouped compared to the rest of the year when they try to stay together in groups of up to 150. Agile and fast in case of danger, fallow deer can run up to a maximum speed of 30 mph (48 km/h)over short distances (being naturally less muscular than other cervids such as roe deer, they are not as fast). Fallow deer can also make jumps up to 1.75 metres high and up to 5 metres in length.